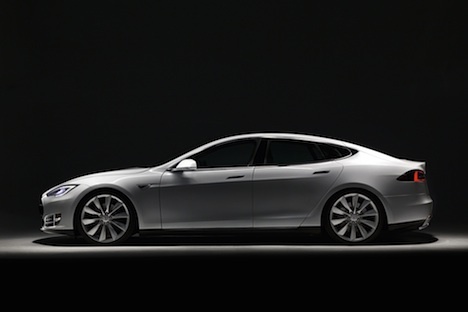 Telsa Motors has announced it will start delivering its much anticipated Model S on June 22. This is a month ahead of expected. Company founder and CEO Elon Musk has said Model S crash testing has now been completed and the cars are ready for launch. It will be the first launch of a new model since the initial, and decidedly niche-market, all-electric Tesla Roadster was released. There’s a lot riding on the success of the Model S for Tesla, as it aims for not–too–distant profitability. The Silicon Valley–based company also has an all-electric SUV (or is it a minivan? ), the Model X, in development. Impressively, Tesla says it has more than 10,000 orders for the Model S, but all of those won’t be able to be delivered during 2012. In case you were wondering, the price of the Model S ranges from $49,000 to $97,000, depending on its configuration and options, and taking into account the $7,500 tax credit for electric vehicles. The initial “Model S Signature” cars off the line will be at the higher end of the price structure. In addition to the delivery of the first new cars, Tesla will be holding Model S test drive events from July in various U.S. cities. Given the level of interest and curiosity about these high–performance electric cars, not to mention the level of buzz high profile, serial entrepreneur Elon Musk is able to generate, no doubt the events will be well attended.